Dempster Auto Rebuilders Inc engages in providing high quality collision repair. 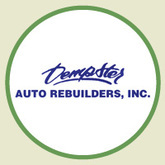 The Dempster Auto Rebuilders operates in Evanston for about 45 years. The employees of the company are all certified through accredited training programs conducted by institutions. The Dempster Auto Rebuilders Company also helps local schools, Chamber of Commerce, PTA functions and also sponsors sports such as Youth Hockey teams, and Little League Baseball. The services provided by Dempster Auto Rebuilders includes body work, refinishing, unibody frame works, alignment, detailing. The company also accepts insurance work from most of the insurance providers. The service of the Dempster Auto Rebuilders comes with warranty. There are currently 0 consumer reviews about Dempster available. Share your review. Please take a note that you are about to post a public review about Dempster corporate office on CorporateOffice.com. This review will be public, so please do not post any of your personal information on this website. If you would like to contact the corporate offices of Dempster, please use their contact information such as their phone number, website, and address listed above to contact them. However, sometimes staff from Dempster headquarters do read the reviews on this website.